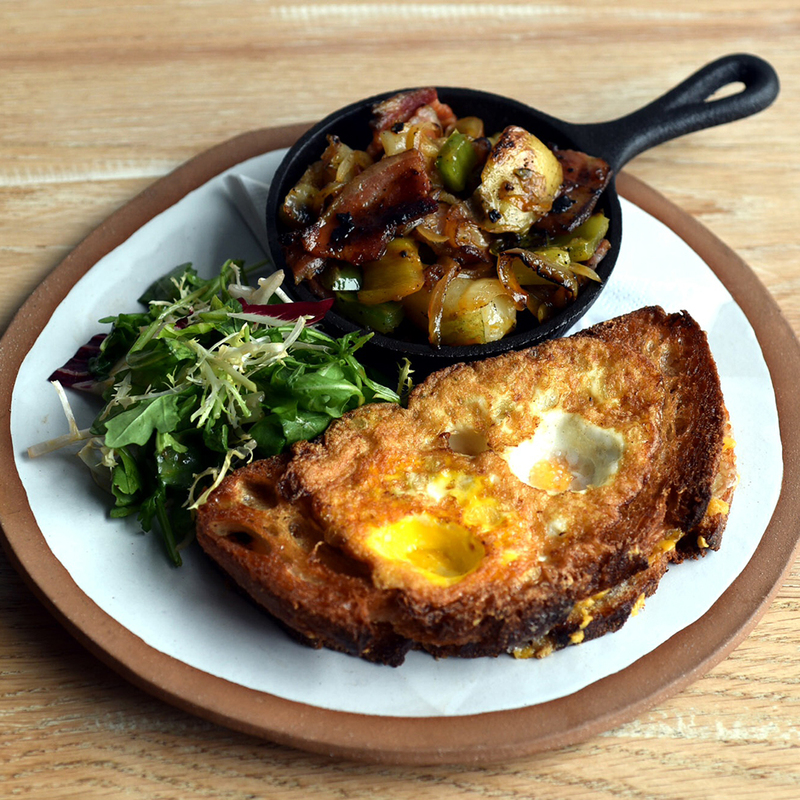 What it is: Marry the comfort food classic grilled cheese with the epic comfort breakfast toad in a hole and you have the ultimate hangover cure. At Faro, in the Bushwick neighborhood of Brooklyn, chef Kevin Adey has mastered the sandwich art form. He lays two buttered slices of sourdough in a pan, one topped with fontina and cheddar cheese, the other with a hole cut out. An egg is cracked into the hole and once that is cooked, that slice of bread is flipped onto the melted cheese slice. This serious sandwich filled with cheesy-eggy goodness is served with a pancetta hash, with peppers, garlic and onions all topped with pimentón oil loaded with paprika and thyme. Wash it down with: You can go two ways: classic, with Faro's Bloody Mary made with tomatoes that have been roasted in a wood-fired oven and mixed with an anchovy caramel; or continue to go big with the Redeye, a blend of vodka, beer, hot sauce and raw egg. The next level has been met.